The NFL, MLB and NBA aren’t the only sports that pack the house at bars and restaurants in the USA. Soccer is the fastest growing sport here in the USA and its the #1 sport worldwide with over 3.5 billion fans. 4 times as many fans watch World Cup on TV than the Super Bowl and we have the World Cup starting June 12th and running through July 13th in 2014. With 64 matches on DIRECTV, that’s a lot of thirsty fans. Soccer fans need someplace to go with their friends where they know they can catch every match their teams play. Soccer fans are among the most dedicated and fervent in the world and bars and restaurants that brand themselves as the soccer HQ in their neighborhood are going to find that they are also big spenders. In addition to alcohol and other spending in your bar or restaurant, soccer fans spend an average of $17 per match on food. Soccer’s top broadcasters are Fox Deportes, Fox Soccer Plus, ESPN HD Deportes, Univision Deportes, beIN SPoRT and MLS Direct Kick. With the recent addition of 4 new stations carrying soccer programming like Barclay’s Premier League on NBC Sports (Channel 220) and La Liga, DIRECTV has more soccer programming available for bars and restaurants than any other provider. With over 2928 matches televised that’s an average of over 8 matches per day. 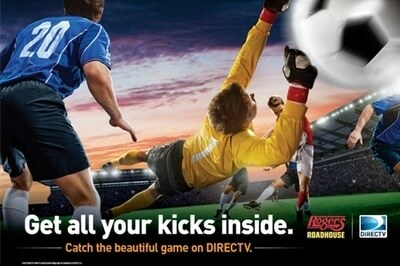 The match your soccer fans want to watch is on DIRECTV. of 2012 there were matches every single day. That will keep the registers ringing. In 2012, the busiest month of soccer was September, with 347 matches. Last year, the most matches in a single day was 33. That’s a lot of tips! DIRECTV gives you more Soccer programming than any other provider and they want to make sure you have what you need to let soccer fans know you have their favorite team on on DIRECTV. So DIRECTV provides you with Banners, Coasters, Posters, Vinyl Window Decals and more to market the fact that your bar or restaurant is the headquarters of Soccer in your neighborhood.